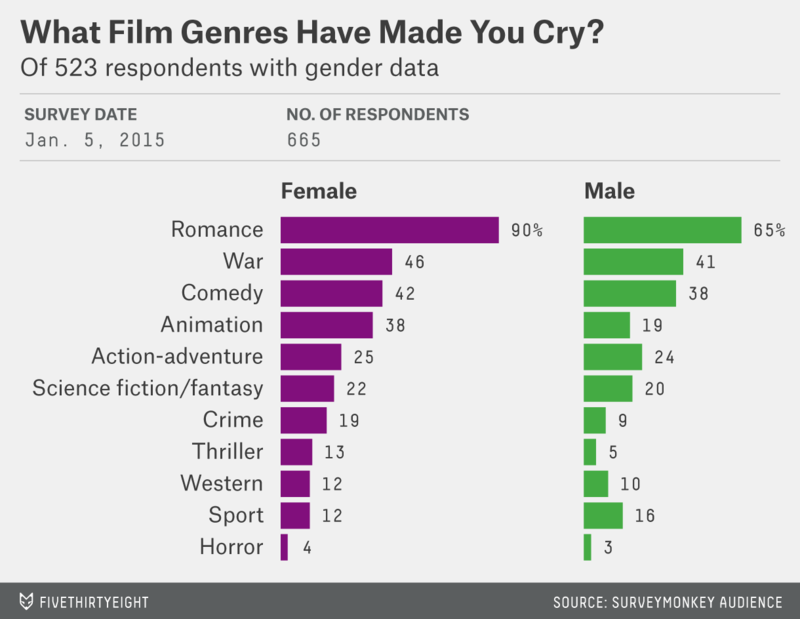 What movies make people cry the most? I asked SurveyMonkey Audience, which conducts polls for us from time to time, to ask people what films — if any — had ever made them cry, or at least made them choke up a bit. Respondents could volunteer up to five films. Still, this leaves us with 4 percent of respondents — about 1 in 25 — who have never been moved even close to tears by any film. Such stoic souls are rare, but they do exist. Here are the biggest tear-jerker films, with the number of times they were mentioned. In total, 596 films were mentioned 2,615 times. But men and women don’t tear up at the same films. Looking at films with more than five mentions, there are several that stick out. 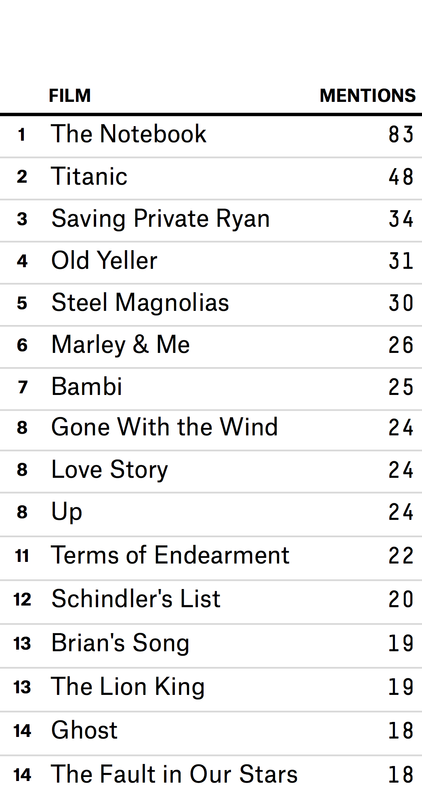 “Field of Dreams,” “Rudy,” “Brian’s Song” and “We Were Soldiers” were the most likely to be listed by men rather than women. On the other end of the spectrum, “Beaches,” “P.S. I Love You,” “Steel Magnolias” and “A Walk To Remember” skewed heavily female. I also asked about the relative tear-jerker-ness of different genres. It’s somewhat interesting to zero in on the 523 respondents for whom we have gender data. Finally, I inquired about television shows and novels to see whether those were any more likely to cry. Only 29 percent of male respondents admitted they had ever been brought to tears by a novel, which probably means our civilization is in desperate need for more books about World War II. What’s more, 61 percent of dudes said they have never been brought to tears by a television show or miniseries. A final note of a personal nature: To the single respondent who listed “Jurassic Park” as a film that has brought them to tears, I need you to contact me as soon as possible. I’m pretty sure you’re my soulmate.